I’m just discovering now that Snoopy has a sister. Yep! Her name is Belle! Maybe I’m a bad Peanuts fan, but none the less, finding that out is pretty awesome. This duo will be on stylish display at San Diego Comic-Con July 9-12, when the distinctive black-and-white striped Belle’s Boutique pop-up shop opens for business. Among all the caped super heroes, comic-book characters, and fantastic villains who will be touring the convention floor, we’re delighted to bring sophisticated Parisian beagle style to Comic-Con with Belle’s Boutique. Snoopy & Belle apparel has proved hugely popular from Paris to Tokyo to New York, and we anticipate a tremendous reception from Comic-Con fans, who know a great look when they see it. 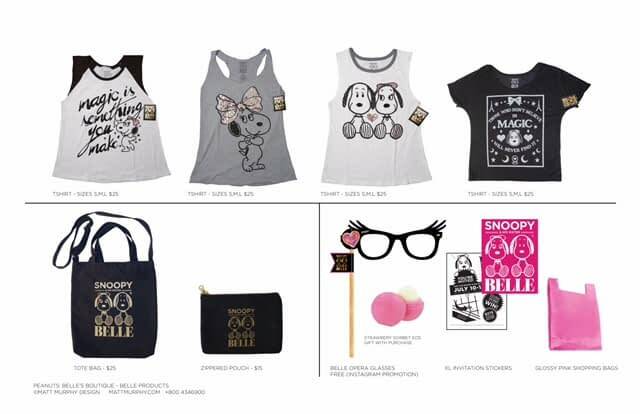 Belle’s Boutique will offer a variety of adorable products featuring Snoopy & Belle, including exclusive tees, sophisticated tote bags, and stylish accessories, including a zippered pouch. The products range in price from $15 to $25 and the pop-up shop can be found at 226 5th Ave, in the Gaslamp District of San Diego. It will be open from noon – 8:00pm during the four days of Comic-Con. As an added bonus, each day the first 250 customers will receive a free EOS Strawberry Sorbet lip balms with their purchase. A pair of Belle opera glasses will be given free to everyone who visits the shop. Sounds like a pretty good deal to me. Be sure to check this out if you’re in the area! You can browse some of the merchandise below.